Here’s a spectacular holiday platter. Perfect for an appetizer, open house and much of it is do-ahead and easy to assemble last minute. Make your marinated onions – Thinly slice the red onion. Place the slices in a container and pour the olive oil and red wine vinegar over. Add the dried oregano. Cover and let sit at room temperature to marinate for at least an hour. Marinate the shrimp for 20 minutes in a mixture of olive oil, salt, pepper, red pepper flakes, lemon zest, lemon juice and garlic. While the shrimp is marinating, slice the baguette lengthwise as thinly as you can. Brush with olive oil. Place in a 350 F oven until golden, about 8-10 minutes, flipping halfway through. Mix the clarified butter and the compliant hot sauce together right before cooking shrimp. Warm Slightly and Set aside. Over high heat on the stove, get a large pan really hot. Add a couple tablespoons of olive oil to the pan and using tongs, pull each shrimp out and place in a single layer in the pan. Cook for 3 minutes a side. If your pan is not big enough you may have to do them in batches. When the last batch of shrimp is done cooking, add all the shrimp back to the pan, turn off the heat and pour the magic elixir sauce over the shrimp. Toss to coat well. Assemble your platter. 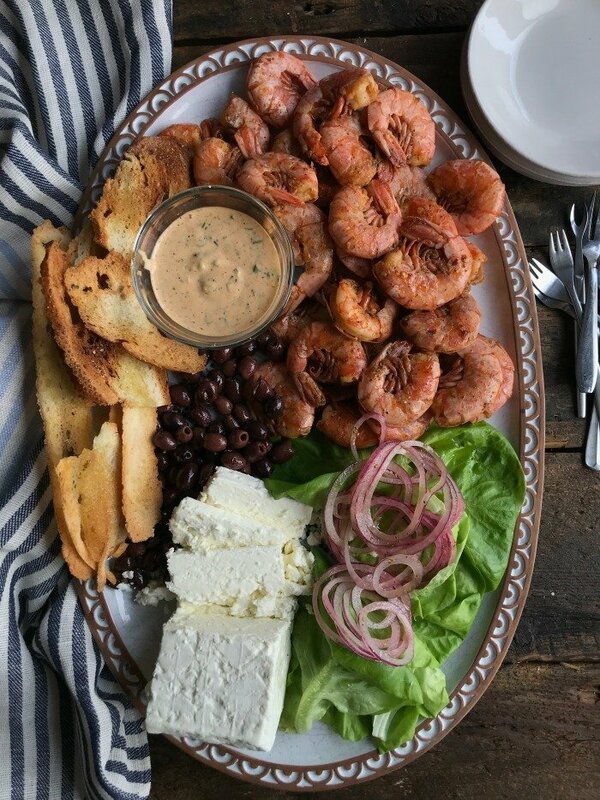 Lay down the lettuce, then place the shrimp down, add a block of Feta, then olives and toasted baguette slices. Top with marinated onions and place the spicy remoulade sauce in the center. Serve and Enjoy. Mix all remoulade ingredients together to combine well.